A barrel of monkeys is believed to be so fun, that it’s used as the basis for which all other fun activities are compared to. Truth be told, it makes no real sense; a single monkey swinging freely in the air without a care in the world seems like it would be a whole lot more fun than a bunch of screaming primates locked up in a tight container. The good news is that’s exactly what you are going to get with Benji Bananas! Swing from tree to tree as if you were Tarzan, see how long you can stay airborne, and grab as many bananas as possible in the process. 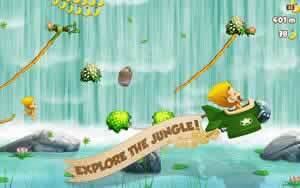 Benj Bananas is a fast-paced game with nary a slow moment, and it’s available for your iOS or Android device for free! Benji Bananas is an intensive runner with more verticality and no actual running. 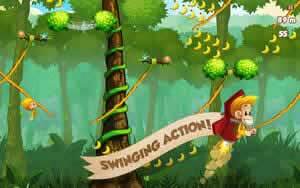 You’ll take control of Benji, a monkey with boundless amounts of energy, and swing him in the air from one vine to the next in his vibrant jungle home. He’s on a quest to woo his sweetheart and only you can make sure he gets the girl and lives happily ever after. How high can you get and how far can you go? Grab a vine and see for yourself! Features gorgeous and colorful hand-drawn visuals loaded with style and personality. See all sorts of sights, from tropical foliage, vibrant waterfalls, mystical Aztec ruins, and more. Swing low and swing high. Leap high in the sky or fall low to reach vines in all areas of the world. Swing from a variety of different things, including normal vines, slippery vines, burning ropes, snakes and more. Tap your screen at the right times to grab hold of vines and leap into the air. Vines swing to and fro realistically with Benji’s weight. Swing forever if you can. As long as you’re in the air, the game will never end. Don’t hit the ground or your swinging will come to a premature end. Benji’s jungle home might be a gorgeous place to live in, but it’s riddled with all sorts of dangers. Take care and do your best to stay away from them while you swing, unless you want to ruin a monkey’s good day. Stay away from spike pods. They’ll stop your leaps dead in the air and send you straight for the ground. Watch out for tigers. They’re hungry and will want to take a bite out of Benji if he gets too close. Benji is a pretty capable simian all by himself, but he can always get better. Benji Bananas has a great number of ways you can upgrade our hero. Grab bananas by the bucketfuls as you swing. They are delicious, nutritious, are needed to attract a good girl monkey, and can be used to purchase new stuff from the in-game store. Use the Head Start to begin your airborne trek with a powerful leap you could not otherwise pull of on your normal stumpy legs. Get Tiger Strike to bop those pesky tiger on the head before they get a chance to bite you. Use Snake Oil to get a better grip on snakes. Buy a cape to glide in the air. Activate the Rocket Boost to rocket forward at high speeds into the air. If normal runners just don’t do it for you, then maybe Benji Bananas has just the thing you need. It has the same adrenaline-pumping action the genre is most known for, but it has a far more dynamic sense of motion and a great number of upgrades and power-ups to keep you coming back for more. The lush cartoon visuals are truly a sight to behold on a screen that can fit in the palm of your hands, and the touchscreen controls are fast and responsive. 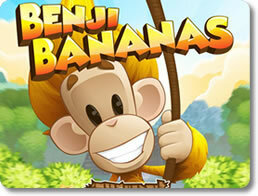 Get Benji Bananas and see what everyone is going completely bananas for in the mobile gaming world.